As a result of the Regulation on the European Company and the Tenth Council Directive, all Member States are obliged to finally implement the merger arrangements of the 1990 Fiscal Merger Directive, forcefully raising the question of the tax consequences of cross-border mergers. This book is the first to focus in such an extended way on the meaning of the 1990 Directive’s tax provisions in this context. With unique and valuable insights drawn from legislative history documents never examined before, its detailed commentary leads to sound and practical recommendations on cross-border mergers within the EU from a tax law perspective. This book also examines to what extent taxation as a result of mergers is in line with the freedom of establishment and the free movement of capital. 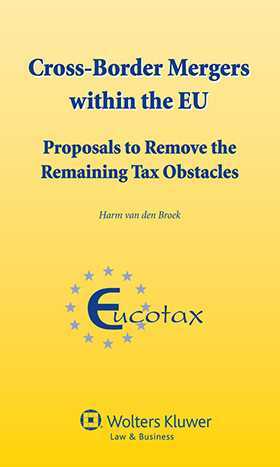 With its new insights on tax aspects of mergers within the European Union, this book will be of special value to merging companies and their shareholders, to tax administrations and courts, and to legislators who must properly implement the Merger Directive. Chapter 2 Mergers under Private International Law. Chapter 3 Regulation and Directive on the European Company (SE). Chapter 4 The Tenth Council Directive. Chapter 5 Cross-Border Mergers Based on Treaty Freedoms. Chapter 6 The Merger Directive. Chapter 7 Tax Arrangements and Treaty Freedoms. Chapter 10 Proposals and Recommendations. Appendix I Draft Directive COM(1969)5 of 16 January 1969. Appendix II Council Statements on Directive 90/434. Appendix III Draft 1970 SE Regulation. Appendix IV Legal History of the Merger Directive. Appendix V Tables of Conversion. Appendix VI Table of Cases. Appendix VII The Netherlands Model Conditions under Article 14b(3) CITA. Appendix VIII Other Netherlands Decrees.